The other day I was reflecting on the single most common human suffering: The never ending grasping towards fulfillment. We hunger for satisfaction, and project a feeling of fulfillment onto the future. I get that new job. I meet my soul mate. I find the perfect home. I complete my work of art. I find my life purpose. I take that next workshop. I heal my childhood wounds. In this tender, painful, compulsive orientation towards reality, we constantly hunger for a feeling of fulfillment. We imagine that once we obtain the elusive object of our desire, we will somehow feel Complete within ourselves. We might imagine that we will at last be able to enjoy life in a way we are not able to now in our state of hunger. We might even imagine that suddenly we will be able to be present, in the moment, fully alive. As though once we obtain this shimmering goal, our lives will finally begin. We will finally able to rest in contentment. Of course, you know how this goes. We obtain the object of our desire, or the goal that contains our projection of fulfillment, we allow for a brief feeling of satisfaction and then we invent the next thing that we believe will bring us to some imaginary place of completion. We project our fulfillment again and again. On and on. An endless wheel of samsara. The dream state, cluttered with illusions of some perfect heaven that is just on the horizon. It seems to be built into us as human beings. This vague sense that there is some beautiful blissful ecstatic place of absolute perfection. Its somewhere, not here. Somewhere, somehow, we must find it. And our chasing of this ultimate place becomes the greatest unrequited romance of our lives. Isn't this the very thing that advertisers are constantly seducing us with? We possess a powerful hunger for fulfillment. And an equally powerful sense that something essential is missing. I always notice this pattern most strikingly when I plan to travel or take a vacation. You invest tons of time and energy and attention into planning this trip. Fantasizing about the future. Consciously or unconsciously, you imagine yourself arriving to the destination and feeling full and alive. More full and alive than you feel now. You imagine you will be happy, in the flow, in harmony with yourself and the environment. You will really be savoring life. Enjoying life. Being in the moment. Being yourself. More yourself than you feel right now. You will be you, but peaceful, content, resting in the fullness of simply BEing. You will become the best version of yourself. The you who you Really are. Then you get there and you realize....You are just the same. You are still you, just with a different background. You are still a bit awkward and dissatisfied. A bit neurotic. You allow for some enjoyment. You experience some pleasure. And you struggle just the same. Soon, realizing you are not fulfilled in the way you had imagined, you begin fixating on the next fantasy that will bring you contentment. Perhaps even planning all the wonderful things you will do when you arrive back home! Its almost comical the way we continuously expect the next thing to get us to that ultimate place. Yet each time it never does. Then occurred to me: What we really want is to stop wanting. We want to stop wanting. We hunger and chase after what we hope will finally at last end our painful state of separation from fulfillment. You can try this experiment: Locate a strong Desire. Then ask yourself: Why do I desire this? Continue asking Why? To each answer you receive. To stop wanting. To stop grasping for future satisfaction. To be fully existing in peaceful contentment with Here and Now. To exist in a state of Being rather than Doing. Receiving rather than chasing. Full rather than hungry. In Tantra it is said that there is only one Desire: The Desire for God. God, being the simplest word available to name the utterly indescribable, radiantly empty, vibrantly full presence at the Heart of Reality. The supremely free and intelligent awareness that permeates every cell, atom, and corner of the universe. From here onward, this presence will be referred to as the ONE. Underneath every Desire is the longing for the ONE. To taste this Absolute. To experience Oneness with the Self. Unification with the Source. The Desires we chase after may have the decorations of our personal particularities, but underneath them all is a hunger to rest in the ONE. Why is it that our Desires never seem to get us there? Our constant chasing seems to be a symptom of our state of separation and duality. We believe we must go "out there" to find it. Yet "out there" never quite brings us to this luminous place we crave so deeply. So close you can’t see it. So deep you can’t fathom it. So simple you can’t believe it. So good you can’t accept it. Just for a moment, hold in your awareness something you are deeply desiring in your life. Something you find yourself reaching, grasping or hungering after with a lot of intensity. Now, imagine how you will feel once you get this thing. Notice the STATE that arises in you. As you feel into the state that arises, you begin to recognize how palpable it really is. How utterly close it feels. In fact, its so close you can actually taste it right NOW. This is why we chase after our desires with such intensity of conviction: because a part of us knows this place of wholeness exists. We remember it. We know it intimately. We know it because we ARE it. Underneath our grasping, this is the ultimate fulfillment we crave. To rest in the nourishing fullness of our inner most Being, the state of Oneness within ourselves. Union with the ONE who dwells within all things and is the very core of our consciousness. This is where we keep hoping our desires will lead us. What an incredible paradox. We hunger for that which we already ARE. The ONE that we keep hungering for, is actually available to us right NOW. It is available to us because it is not separate from our own innate consciousness. Suddenly the Ouroboros flashed through my vision, taking on a whole new meaning. 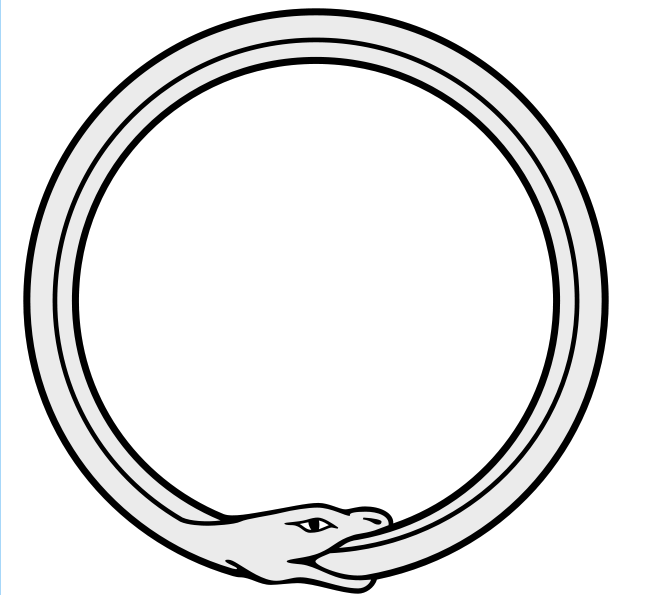 The snake, hungry for that which it already IS, eats itself in an endless loop of desire and nourishment. An ongoing dance of infinite hunger and ultimate satisfaction. The ONE is intrinsic to who we are. Desire has been called the root of all suffering. Its been more than problematic for spiritual seekers. Some have attempted to solve this dilemma through asceticism, essentially starving the self of all desires. Or hedonism, the unrestrained pursuit of all desires. The Ourobouros as it appeared to me now, seemed to be playfully winking to this Desire conundrum. Yes, Desire is endless. Its not just inevitable. It is a vital to life itself. The mouth of the snake is perpetually open, hungry, seeking. But because the root of Desire is a hunger for Source, for Pure Being, for the state of inner fullness that is union with the ONE. Because the ONE is not separate from our own innate consciousness. The snake simply eats itself. Hunger and nourishment cycle infinitely inside its body. Desire and Fulfillment pulse simultaneously in Non-Dual Union. The line of linear time, the ultimate symbol of future projection, wraps itself into a circle. Whole. Complete. Contained. Non-Dual Inner Tantric Yoga is learning to feed the snake its own tail. Shiva- The formless bliss of supreme awareness is not separate from Shakti, the Goddess- our body, mind, senses and heart. Penetrating awareness into ordinary phenomena within the present moment delivers the Yogi into unity with the ONE. These Inner Yogas are technologies for the cultivation of true nourishment through the alchemy of precise concentration and surrendered receptivity. In Tantra, we merge our awareness into the pranas, breath, energy, emotions, tasting, touching, smelling, hearing, seeing, feeling as direct gateways into this state of Inner Oneness. Even Desire itself is eaten as nourishment. Even the dense energy of Fear is the Shakti we ride into the wide open space of Shiva. Even the pain of separation is the chasm we use to fall into God. The Tantrika slips between the cracks of reality, in the subtle pulsation between one moment and the next, between one breath and the next, where all grasping at the future dissolves into the spacious ground of BEing. One of my favorite yogic manuals for accessing these technologies is the Vignana Bhairava Tantra which translates as the "Mystical Text of the Ultimate Reality." These Yogic Sutras reveal that because the Supremely Free Awareness of the Ultimate Reality is not separate from our own Core Essence, just the slightest shift in awareness can drop us beneath the ordinary mind, dissolving the veil of separation. The Inner Tantras are like technologies to access this innate fullness of God/Source/Oneness that dwells within. What an incredible paradox. We hunger and crave the satisfaction that is already to available to us as our own INNATE BEING. We are what we Seek. We are that which we are most Longing for. We are the Snake, eating its tail.